Reflecting the slow pace of recovery in the overall housing market, the home remodeling industry is expected to continue its path of moderating growth, according to the Joint Center's most recent Leading Indicator of Remodeling Activity (LIRA), released today. 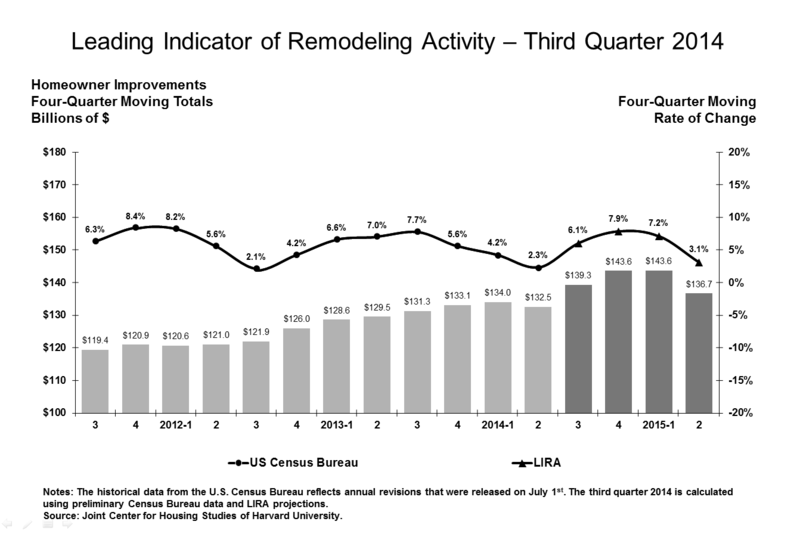 The LIRA projects annual growth in home improvement spending to ease to 3.1% through the second quarter of 2015. Stronger gains in remodeling activity are unlikely given the recent slowdowns we’ve seen in housing starts, sales, and house price gains. While the continued recovery in employment should ultimately keep the market on an upward trajectory, remodeling is likely to see slower growth rates moving into 2015. Growth in home remodeling activity continues to hover around its longer-term average of mid-single digit gains. Even though the housing market overall has been lackluster, many areas of the country remain economically healthy and remodeling contractor sentiment remains high. NOTE ON LIRA MODEL: An important change was made to the LIRA estimation model beginning with the first quarter 2014 release. With the upheaval in financial markets in recent years, the traditional relationship between interest rates and home improvement spending has significantly deteriorated. As a result, long-term interest rates have been removed from the LIRA estimation model. For more information on the implications of this change, please read our blog post from April. For more information about the LIRA, including how it is calculated, visit the Joint Center website. Who Doesn't Want to Own a Home?